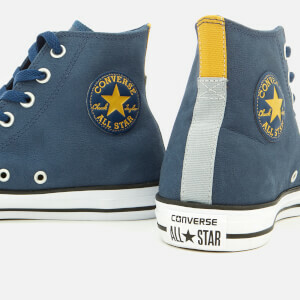 Men’s ‘Chuck Taylor’ trainers from Converse. 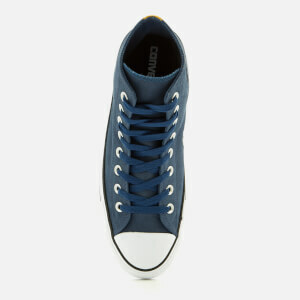 Crafted with dusty blue canvas uppers, the hi-top sneakers comprise a rounded toe with a signature rubber toe cap and a lace up fastening with contrast coloured laces and silver-tone eyelets. 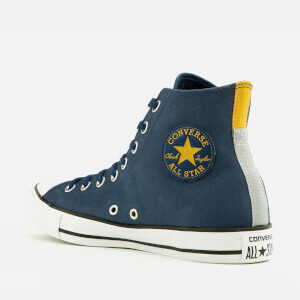 Placed upon a contrasting rubber sole with a signature striped midsole, the high tops are complete with an All Star logo patch to the inside foot and a license plate at the heel. Finished with a matching vertical panel to the heel. Bought myself a pair. 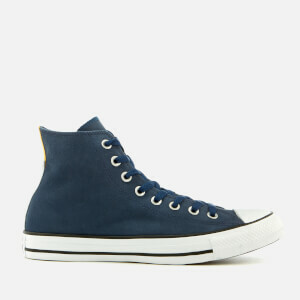 A bit uncomfortable otherwise great looking and stylish shoes. Shoes arrived as described.